Adventures by the Book® offers worldwide opportunities for readers to connect with authors and their books on an intimate basis through unique, interesting, and adventurous travels & events. Adventures by the Book, LLC was created in 2011 by Founder and CEO Susan McBeth, the name behind some of the biggest literary events in San Diego and beyond. Susan couldn’t escape the feeling that traditional book signings were missing something. Shouldn’t an author’s personal presence be used to create a more unique experience? Susan launched ABTB to connect authors and their books with the local reading community through custom designed, interactive, and what we like to call “multi-sensorial,” literary events. Adventures by the Book® has since become a home base for passionate readers, published authors, aspiring writers, and others who enjoy engaging cultural events and the written word. The fact is: when readers and their favorite authors share a person exchange, magic happens. Adventures by the Book® founder Susan McBeth has specialized in event planning for over 30 years. Before launching Adventures by the Book® and NovelNetwork®, she was the Director of Marketing and Events for one of the oldest independent bookstores in the United States. Through her career, Susan has had extensive experience working alongside publishers, publicists, agents, authors, and readers. Her experience and creativity led her to develop a dynamic brand of literary events designed to meet and exceed the expectations of readers and authors. 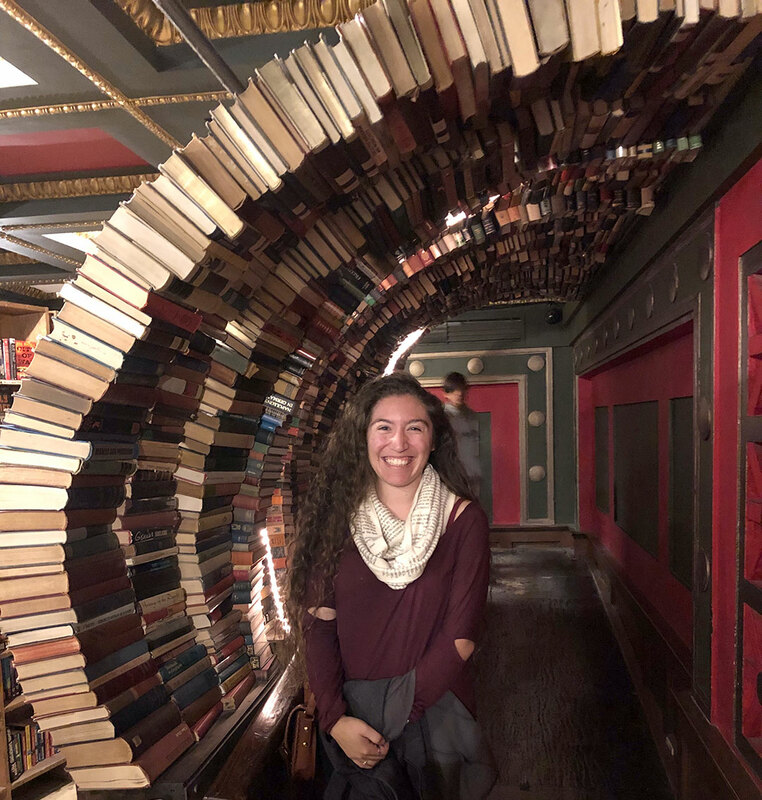 Adventures by the Book® Director of Events Selina Valladolid had been working in independent bookstores since her first year of college at the University of California, San Diego. Forever a lover of STEM, she was studying Astrophysics for four years until she realized that her dream was to continue working in books instead of a lab. So in her fourth year of college, Selina switched over to a major in literature and was accepted into the honors program. Selina graduated from UCSD in 2018 with a degree in World Literature with Honors. Her thesis was titled “The Suffrage Movement’s Reclamation of Jane Austen.” Her passion led her to join the Adventures by the Book® team soon after graduation, and she is excited for all the possibilities that books can bring. Susan McBeth is one of the most effective people I’ve worked with in my 17 years of publishing. For my latest books, WHEN, she arranged a variety of events— from public libraries to private companies— all of which were flawlessly organized and packed with readers. And thanks to her, I sold a huge number of books! Susan McBeth threw together the most memorable and successful book signing event on my cross-country cookbook tour. While most of my stops were held in a traditional book store/book reading setting, Susan planned and created a unique author-reader experience where we could all connect on a more personal level, sharing stories, laughs, and most importantly– great wine and chocolate. She took care of every detail from securing the location to taking photos of every single reader and I. I kept overhearing readers saying how much fun they had. I can’t wait for my next event with Adventures by the Book®! I absolutely loved working with Susan and Adventures by the Book® — she has a gift for connecting thought-leaders companies who resonate, and the result is a wonderful, unique event that benefits all involved. She helped arrange an author talk at my corporate alma mater, Google, and the event was fun, warm, insightful, smooth, and inspiring from start to finish. I am a little in awe of Susan McBeth and her many skills…Susan shares her love of books with us all in the most wonderful way. She really does do an amazing job, bringing readers and writers together – I have very fond memories of Adventures by the Book® in San Diego…The Westgate Hotel, a very good cup of tea (so important for us British writers!) and a wonderful opportunity to spend time with readers, all thanks to Susan and her brilliant book events. The Weird Sisters and I had a wonderful time with Adventures by the Book® in San Diego…Susan took care of every detail, from choosing a lovely, intimate local restaurant to inviting performers from the San Diego Shakespeare Society who added drama and fun to our absolutely perfect evening. As both a lover of books and a novelist who writes them, I’ve seen up close how the brilliant minds at Adventures by the Book® tailor experiences that are a delight for both readers and authors. Each event is carefully crafted to be unique and enjoyable and special, like a date-night for book lovers. Every detail was perfect and the event was run so smoothly and professionally. Thanks so much for all the work that went into making it such a success. It was the last event on Bill Nye’s first leg of the book tour and it was great to end on such a high note. What a joy it is working with Susan McBeth and Adventures by the Book®. The Carlsbad Reads Together event she arranged with the wonderful people at the Carlsbad Library was full of gracious book lovers, mentally stimulating, and great fun. I’ve done a lot of book events, but thanks to Susan this one stands out as a special delight! Susan so graciously and brilliantly pulled off two incredible sold out events, “Fancy Nancy Teas” at San Diego’s Westgate Hotel, which was raved about by all attendees…Every detail was creative, charming, and memorable. In fact that is what Susan does, she creates something that you will never forget! Adventures by the Book® was one of my favorite book events in years. It was what an evening about books should be: fun, engaging, and a great opportunity to really sit down with readers. Susan McBeth has her pulse on the future of book events, and I can’t wait to do another event with her. Susan is providing such an important service in bringing authors and readers together, and she does it in such a fun way. At my events with Adventures by the Book®, everyone had such a good time; her fans are devoted and the events are a treat for every author. Adventures By The Book is a gift for authors and readers alike. Susan McBeth’s book-themed events are entertaining, well-run, literary good fun for book-lovers of all kinds, and authors will appreciate the smooth organization and attention to detail. Highly recommended! Adventures by the Book® takes book signings to a whole new level! Each event is perfectly tailored to each author and their novel and delivers voracious new readers. Highly recommend! Susan McBeth is such a wonderful hostess that after my experience with her and Adventures by the Book®, I felt not only that I had a grand welcome and introduction to enthusiastic new reading audiences but had made a new and lasting friend. Susan is so organized, so committed to her authors, and so passionate about matchmaking writers and readers that she goes above-and-beyond to set up creative, exuberant events. I felt so happy and comfortable with her that I am traveling overseas in May 2017 for our Germany Adventure by the Book® tour – and there can’t be a higher endorsement than that! Just leaving my event in San Francisco and I wanted Susan McBeth to know how much I loved the event. The whole ambiance; the audience, the conversations in the signing line. All really a pleasure!!! . . . Authors should know they are going to have a warm and gratifying experience at Adventures by the Book® events! As a debut author I could not ask for anything better than a sold-out event hosted by Susan McBeth and Adventures by the Book®. It was a wonderful opportunity for me to connect with eager readers who were intrigued by my story. The event itself ran as smoothly as silk, and the venue was wonderfully charming and fun. I’m keenly aware of and grateful for Susan’s efforts at promoting not just the event but my novel as well – a key element, I believe, in the success of our English Tea Adventure. I would do it again in a heartbeat. Susan McBeth makes the best things happen. 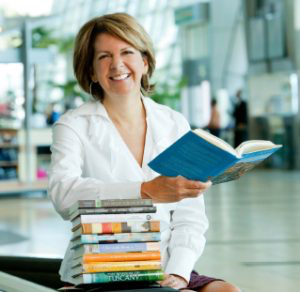 She brings writers and readers together in active, personal, and creative ways.. ..Susan’s indomitable spirit prompts her to imagine a wide variety of venues and joint author-reader activities. Gone are the static readings in a bookstore…Brava for Susan’s brainchild, Adventures by the Book®. I can’t wait for my next one, whatever it will be. The Alaska-San Diego author exchange was impeccably organized, with attention lavished on every detail. Displaying whirlwind energy, Susan connected authors with one another and with new readers. Spirited interactions, the forging of new friendships, all wrapped up in travel experiences that infused authors with fresh inspiration – kudos to Adventures by the Book® for another innovative idea transformed to reality! Susan McBeth and Adventures by the Book® have elevated our author-based programming at Qualcomm. Susan always connects us to authors who are sharing new and innovative ideas and outlooks on the world. Our Adventures by the Book® partnership allows employees to take a break, invite their families to campus, and learn something new. And we love providing our employees with an autographed book!